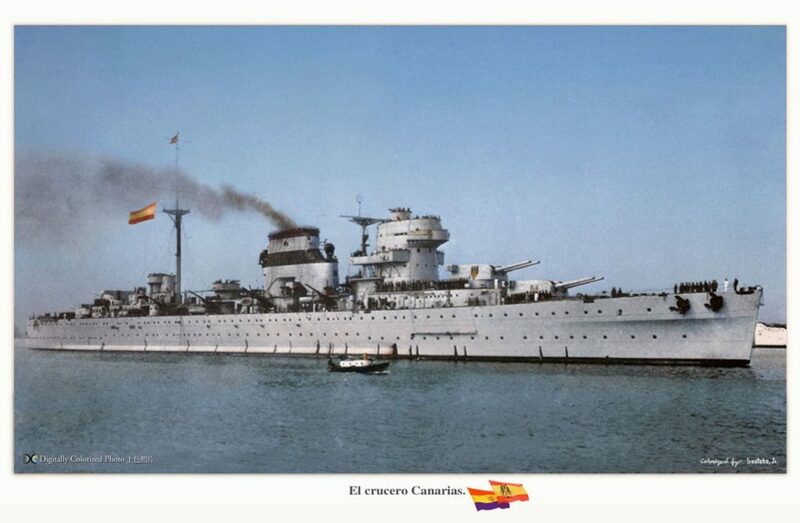 The two heavy cruisers Canarias and Baleares were the first of this kind built in Spain. 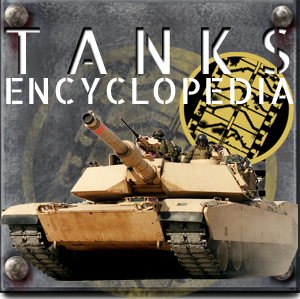 They were ruled by the Washington Treaty, of the classic “8×8 inches – 10,000 tons” type, whereas Spain never signed the treaty. Proceeding as usual in consulting British engineers, including Phillip Watts, the Spanish built their ships locally, strongly inspired by Kent class (County class). However the civil war erupted and both ships were captured by the nationalists. They would be used against the Republican navy and shipping with great efficience. Only the Canarias survived and stayed in service through WW2 and the early cold war, only discarded in 1975. Provision for the two cruisers started as soon as the Cortes approved the new naval plan and a commission contacted the shipyard responsible for the lead ship of the “County” class in Great Britain by 1926. 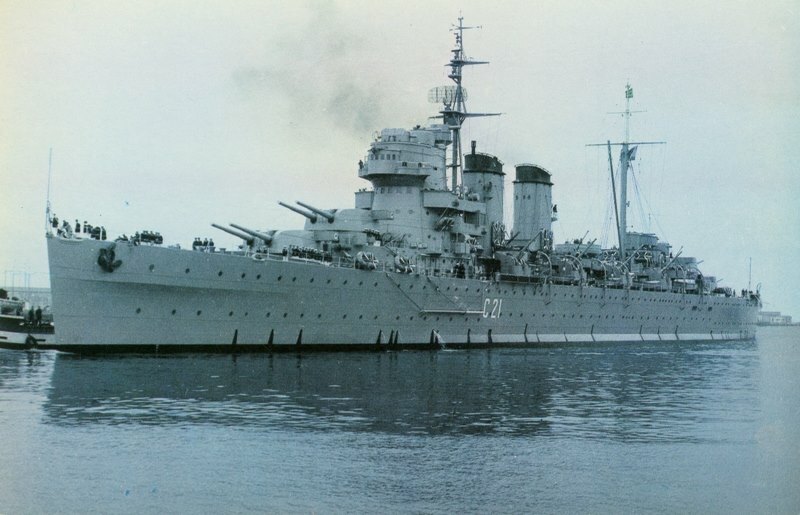 This year, Sir Philips Watts, former director of the Technical Service of the British Admiralty and designer of the previous class Prince Alfonso (renamed “Galicia”) was contacted. The Canarias’s construction was ordered during the Government of General Miguel Primo de Rivera, but it was considerably delayed after the proclamation of the Second Republic in 1931 and did not enter into service until the civil war, seized by the Nationalists still uncomplete. The hull’s dismensions and shape, and general arrangement and superstructure (but the bridge) mirrored without doubt the large ocean-going County class. Like previous designs, British inspiration was prevalent. However both ships were built in Spain, and the admiralty altered the design many times in the early 1930s. The differences with the Kent design were numerous for the completed ships: The machines in particular were rearranged in order to provide a little more power, giving them this characteristic single large funnel, allowing them to reach 34 knots. Torpedo tubes were fixed in the hull, bridge superstructure design evolved from the blueprints and ended with this very characteristic look. If the hull was roughly similar to the County design, flush deck, tall and roomy, they had anti-torpedo bulges from the start and a slightly narrower beam. The final ship was also slightly lighter compared to the average County class at 14,150 tons fully loaded. Also as requested by the Spaniards, a more powerful machinery was installed, requiring rearrangements of the machinery space, and the final boiler rooms design made for a trunking of all exhausts into a single massive funnel. 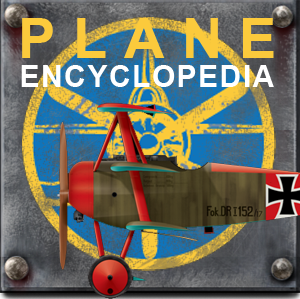 The original design included a catapult for a Hawker seaplane, which was never installed, as well as a powerful secondary AA artillery. Installed rated power was 90,000 shp (67,000 kW), driving four shafts Parsons geared steam turbines fed by eight Yarrow boilers. Top speed, requested and obtained in sea trials (which took place when the civil war broke out) was 33 knots (61 km/h; 38 mph). Overall range was 8,000 nmi (15,000 km; 9,200 mi) at 15 knots (28 km/h; 17 mph). This was much faster than the Counties at 31.5 knots (58.3 km/h; 36.2 mph) but range stayed the same. This long range was no longer required because of the absence of a colonial Empire to patrol, but intended rather to be used as commerce raiders. The Spanish-built Canarias (Ferrol) never received the secondary armament of the County-class and lacked efficient AA. The Canarias when making her sea trials in 1934 was provisionally armed with the 102 and 57 mm guns of the battleship España. She was rearmed later with eight 120 mm AA, 4 twin 20 mm mounts and trwo twin 12.7 mm AA. 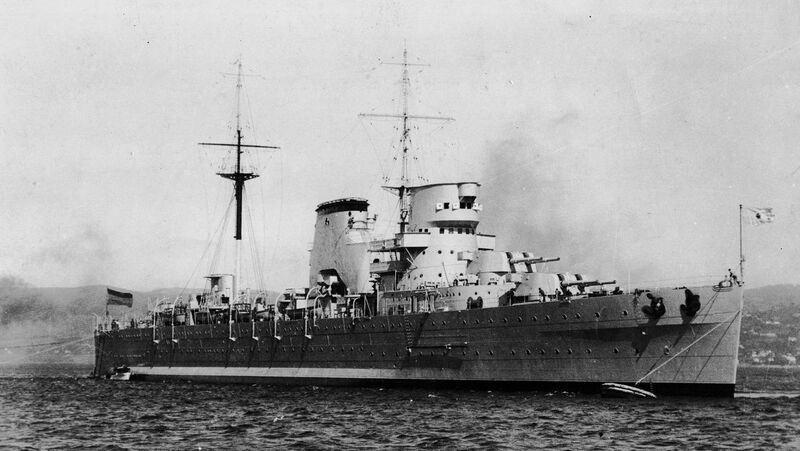 The Baleares was hastily completed by the Nationalists with provisional fire system and the 203 mm rear turrets missing. She was provided 120 mm and 100 mm by the Italians and British 40 mm Bofors AA guns, and her 8-in rear turrets only in 1937. Although the ships were slightly lighter and more powerful, they were not better protected, still constrained by the 10,000 tons limit, and this was woefully inadequate for a heavy cruiser: The belt was 2 in (51 mm), decks 1.5–1 in (38–25 mm), magazine box was 4 in (102 mm), the Turrets 1 in (25 mm)and the Conning tower 1 in (25 mm). 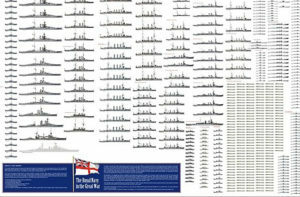 Compared to this, the County class had 1.25-inch (32 mm) over the machinery, 1.5-inch (38 mm) over steering gear, 1–4-inch (25–102 mm) on the main citadel’s sides and 1-to-2.5-inch (25 to 64 mm) crowns while the turrets were 1-inch (25 mm) faces, sides, rears, crowns & barbettes. A naval law, was proposed on 8.9.39 but never voted amidst perspectives of entering into the war, making provisions for the construction, of four battleships and destroyers of two cruisers of the “Super Washington” type carrying reconnaissance planes, derivatives of the Canarias design. 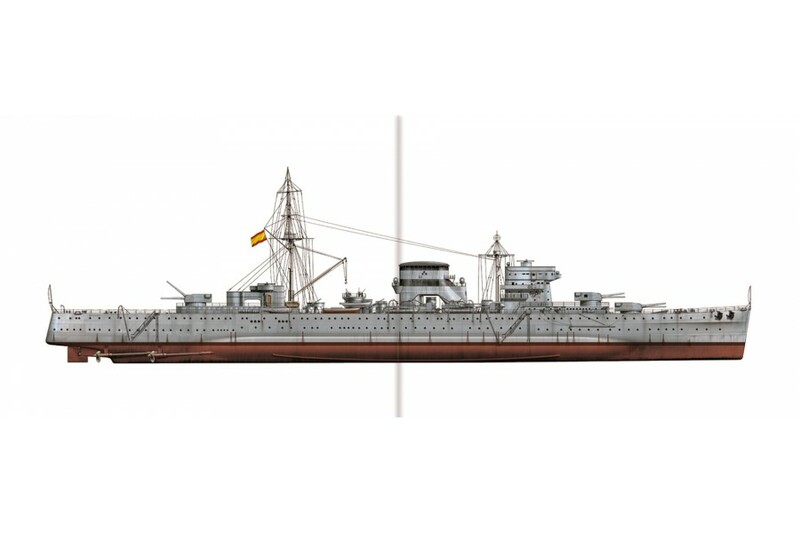 They displaced 17,500 tons fully loaded, but if the armament and silhouette was reminiscent of the Canarias, the difference was in using four triple turrets, a massive leap forward. Ferrol never received the order to lay down the keels. 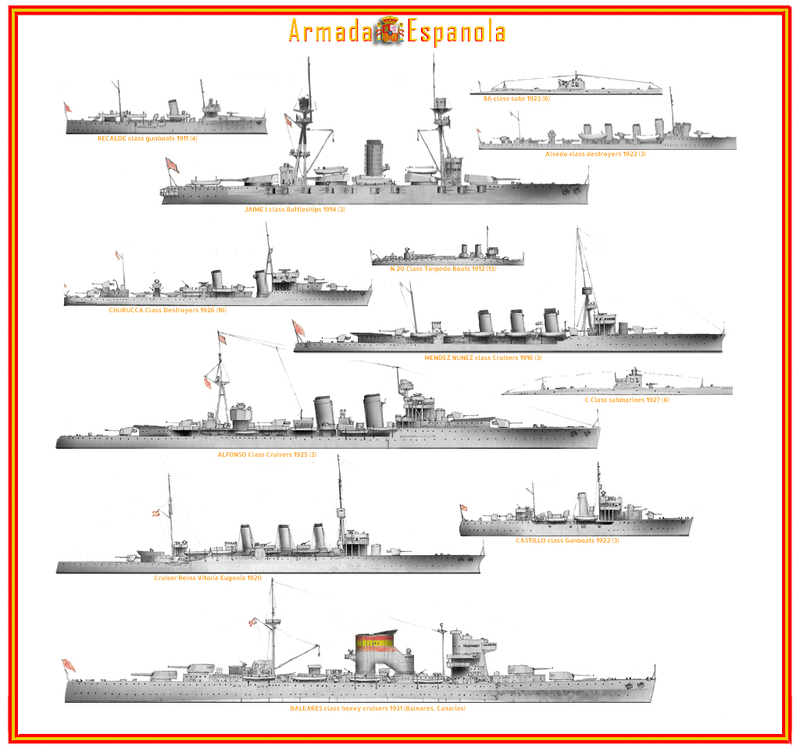 Web poster of Spanish Civil War ships. Bottom: Canarias class. The Baleares was launched on April 20, 1932 and her sister ship Canarias entered into service on December 20, 1936 and the construction of a third cruiser of the same type was abandoned in favor of six “Churruca” class destroyers. 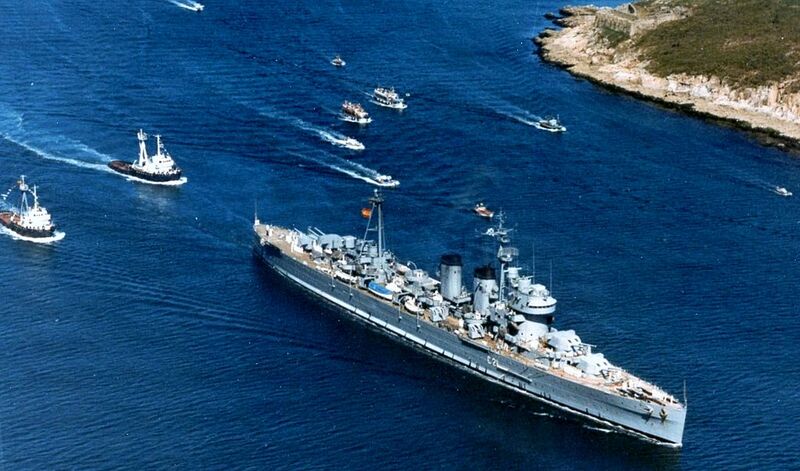 Canarias and Baleares were both making their final sea trials when captured by the Nationalists in 1936. Baleares was completed lately, missing a rear turret for some time. 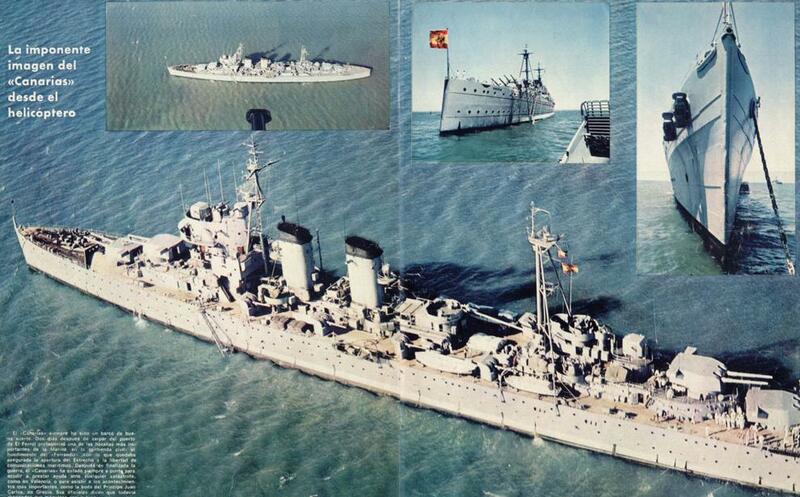 On 12 July 1937, she crossed the path of a convoy pff Valencia, two cargos protected by six Republican destroyers. She fired on them and after a short while, the Republican ships escaped. 7 September 1937 in the afternoon, Baleares attacked another Republican convoy, with four merchant ships escorted by the cruisers Libertad and Méndez Núñez plus six destroyers off Algeria. This fight became the Battle of Cape Cherchell. Basically Libertad and Méndez Núñez spotted and engaged the Baleares, leaving the convoy to break off and escape protected by the destroyers. The duel was intense. The Baleares hit both cruisers but was damaged in return by accurate fire from Libertad. Some critical areas were hit, like a fire in the 120 mm ammunition stores. She escaped and was kept for long repairs. But the fight was partially succesful as in the confusion of the battle, two Republican freighters which changed course in precipitation ran aground near Cape Cherchell. One became a total constructive loss while the other was later towed into safety by French authorities. In March 1938, on the 6th, the Baleares was attacked by the destroyers Barcaiztegui, Lepanto and Artequera at Cape Palos, and sunk in a torpedo. This was the Battle of Cape Palos (see below). 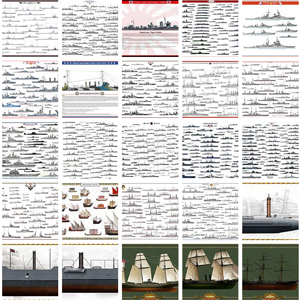 Naval battles of the interware are quite rare. The battle of Cape Palos is one of these rare engagements, not only of Spanish versus Spanish, but with major units involved. It was the largest naval battle of the Spanish Civil War, during the night of March 5–6, 1938, off Carthagena. It all started because of the protection of a convoy with African troops and ammunitions from Italy, vital for the following operations. 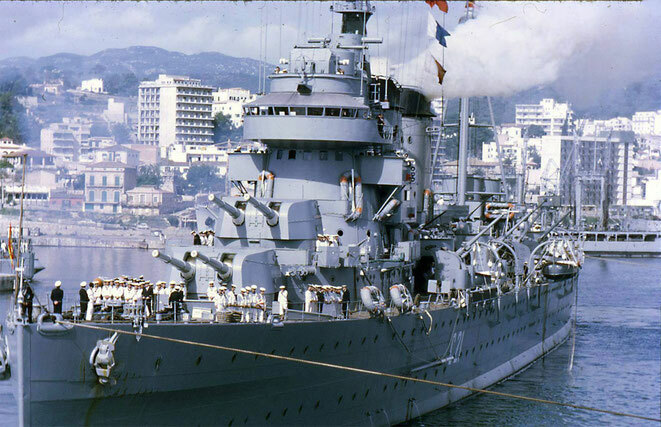 Vice Admiral Manuel Vierna Belando sailed from Palma de Mallorca Naval Base with the two heavy cruisers Canarias and Baleares, light cruiser Almirante Cervera, and three destroyers. Meanwhile, the Spanish Republican Navy under Admiral Luis González de Ubieta sailed from Cartagena with the two light cruisers, Libertad and Méndez Núñez and five destroyers, in search of Belando’s squadron. After a day navigation, the destroyers detached themselves, taking distance. Despite heading in opposing directions the cruisers met by chance during the dead of night of 5–6 March 1938. The two lines were passing by each others when a Republican destroyer spotted the squadron and torpedo attacked, but missed. The more agressive Republican admiral decided to not wait and provoke the fight, turning his ships in the most favourable position. Oventually the Republicans opened fire at 02:15, under 5000 m with the cruiser Libertad. The Nationalists replied, but in the confusion one of these ships fired a star shell, illuminating their position to Republican gunners. In addition, the Republican admiral sent his three desotroyers Sanchéz Barcáiztegui, Lepanto, and Almirante Antequera closing the distance to and firing four torpedoes each. At least two or three of these (possibly from Lepanto), hit the Baleares between ‘A’ and ‘B’ turrets, detonating her forward magazine. The ship blew up but damage was contained enough for the admiral ship (De Vierna had its mark on her) to stay defending the area, while the rest of the fleet was ordered back to protect the convoy. The Baleares would sink later, survivors being picked up by nearb observing british destroyers. The Republicans held the battle as a triumph. Naval commander Luis González de Ubieta was rewarded in all regalia by the government. No other massive engagement of that scale happened until the end of hostilities. Canarias was the flagship of the Nationalist Navy. During her wartime career she managed to sank 34 ships, fufilling her intended commerce raider role, like one of her most famous action against the Soviet merchant Komsomol off Oran, fully loaded with soviet armament. She also sank military ships such as the Spanish Republican destroyer Almirante Ferrándiz (Battle of Cape Espartel). 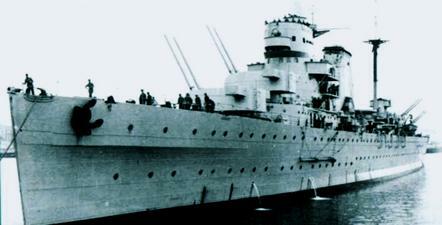 Canarias also was instrumental in the Battle of Cape Machichaco on 5 March 1937. She sank later the Basque Auxiliary Navy naval trawler Nabarra and badly damaged the destroyer José Luis Díez, which narrowly escaped and took refuge at Gibraltar on 29 August 1938. She also captured the Republican liner Mar Cantábrico, later converted to an auxiliary cruiser. The cruiser stayed mostly inactive during WW2, still as flagship, but took part in the search for survivors from the German battleship Bismarck in May 1941, which sank in the nearby bay of Biscay. She only recovered bodies. Suvivors (about 110) has been picked up earlier by British ships nearby the sinking; the bodies were likely exhausted men left in the water for more hours when an U-boat alert was given. 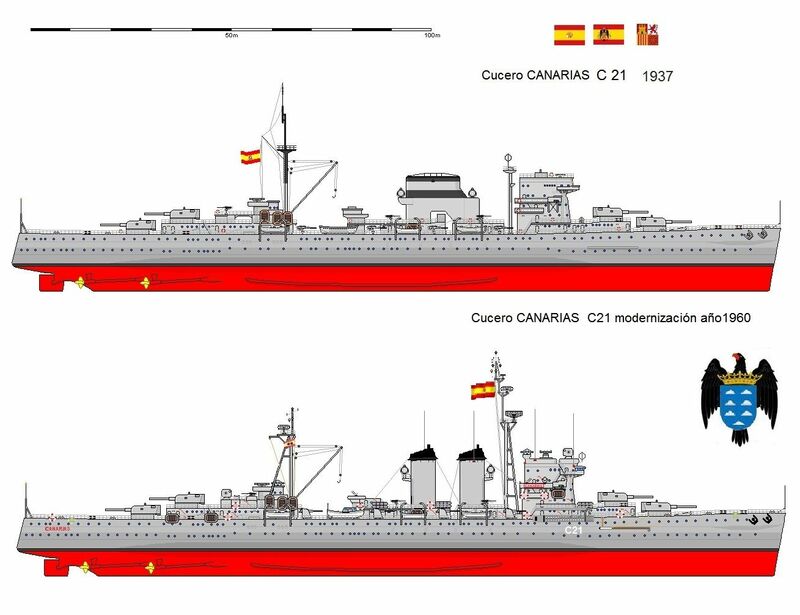 The Canarias survived the conflict, having sank the destroyer Ferrandiz on September 29, 1936 and severely damaged the Diez on November 30, 1938 in the bay of Catalonia. She was modernized in 1940, losing her flank TTs and receiving new shields for her 120 mm guns. The Canarias became not only the last Spanish cruiser, but the oldest “Washington cruiser” worldwide in existence. Towards the end of the 1940s, the 120-millimeter guns were replaced locally-made equivalen fitted with protective mantlets and later German-designed but Spanish-built twin 37 mm AA. She was extensively modernized in 1952-53, with a revised machinery and two funnels, a return to the initial project, as on blueprints a pair of funnels already appeared. The two old Fairey Osprey seaplanes, originally intended to be taken aboard, were dropped in favor of a provision to carry later a light helicopter on the aft deck. The twelve lateral launching tubes were removed in 1960. In 1964, four of her six twin 37/80 mounts were replaced by four singles Vickers 40mm. The Canarias by that time used a whole array of calibers, 20, 37, 40, 120 and 203 millimeters, a nightmare for intendance. The 8-in barrels had been changed multiple times and during the cold war were still a solid proposition for shore bombardment, capable of a volley every 16 seconds at max Rpm. In the later 1960s plans were drawn by the admiralty for a conversion as a missile cruiser, with negociations to get the Terrier SAM, and semi-auto 127 mm turrets were received and stored at El Ferrol, scheduled to take place of the 120 mm. Eventually they were fitted on the cold war destroyers Roger de Lauria and Marques de la Ensenada. Theere was a unique navigation radar but soon a CIC (Combat Information Center) was installed. Radio & detection equipments were modernized as shown in the new larger navigation bridge. Detection however was only equivalent the Jupiter or Alava class frigates. 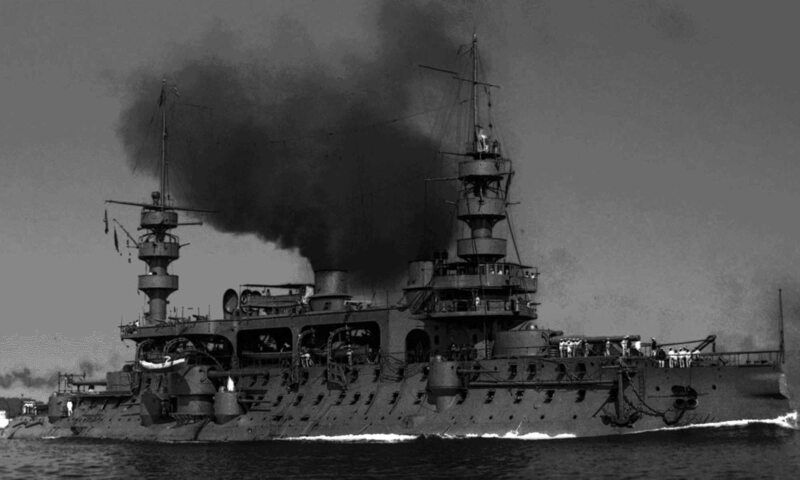 The Canarias remained the flagship of the Fleet when old dreadnoughts were long gone. During her career she cruelly lacked adequate communications systems and task force center proper C&C installations. She was long maintained because of her heavy artillery and speed whereas her antiaircraft artillery provided enough densit. Lastly she was roomy and with a tall freeboard tailored for the bad weather in the Atlanic. For ASW warfare her means were limited to two ASW mortars, soon removed. Partisans for her retirement advanced the limitations of her Washington type design, with a heavy artillery and good speed but on sacrificed protection and overall weak hull. Her tall hull also made a better target. The slow retirement of the Canarias began in 1974, placed in reserve status with reduced crew and commanded by a frigate captain. In 1975 she was struck from the lists for good and placed on auction for scrapping. Plans to keep her as a museum ships was rejected. The hull was sold 62,205,636 pesetas for a construction which cost was 90 million pesetas originally and scrapped aftwards in 1977. Propulsion 4 shafts Parsons turbines, 8 Yarrow boilers, 90,000 hp. Range Up to 8000 nm @ 15 knots.